Lavendar Oaks Farm is a 60-acre farm located in Chapel Hill, North Carolina. It is essentially the perfect farm/barn setting that you are looking for. Not only does it offer 60 acres of incredible open space, but also multiple picturesque barns and an outdoor patio. What’s more romantic than having your wedding amidst fields of lavendar in big beautiful barns? 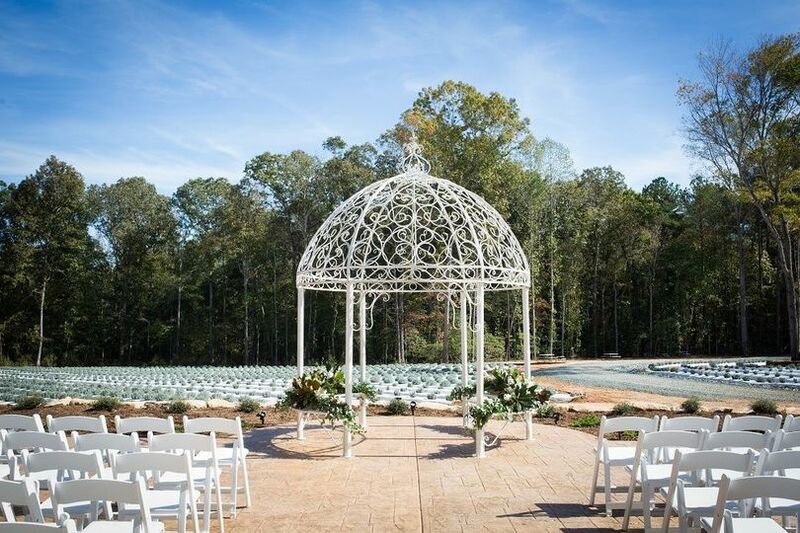 Nature plays a role in weddings here and it’s nature’s beauty and simplicity that stands out at Lavendar Oaks Farm. 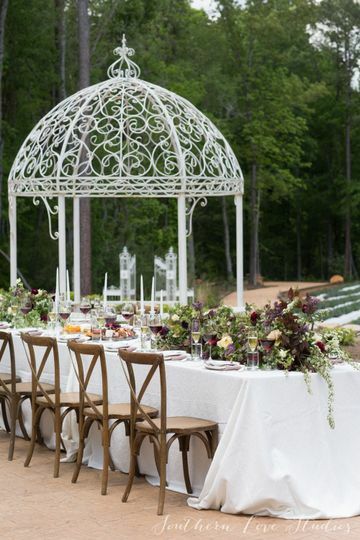 Lavendar Oaks Farm is able to accommodate a maximum capacity of 250 guests. 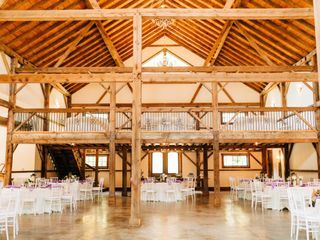 Two historic timber framed barns are available for bridal showers, engagement parties, elopements, ceremonies, rehearsal dinners, and receptions. 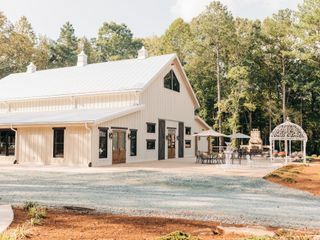 The Lavendar Barn is rustic yet refined, and the heirloom white veil exterior complements the lavendar fields perfectly. 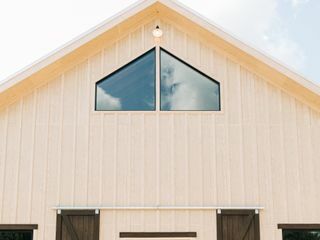 This barn offers 6,700 square feet of space, complete with wrought iron and historic fixtures. 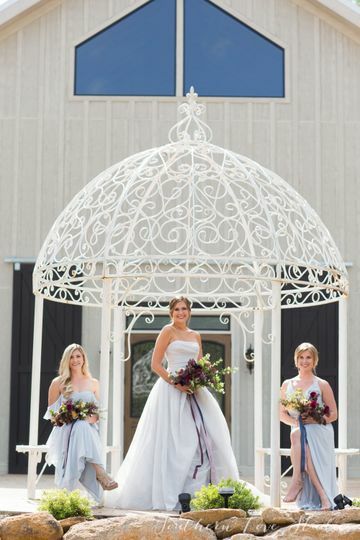 The Lavendar Barn holds two bridal suites and a 1,000 square foot loft. 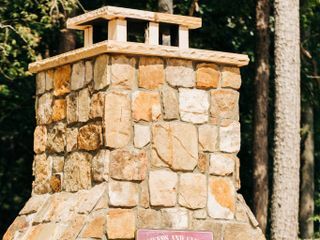 Walk outside onto the outdoor patio which houses a stone fireplace and wrought iron gazebo, to overlook the lavendar fields. 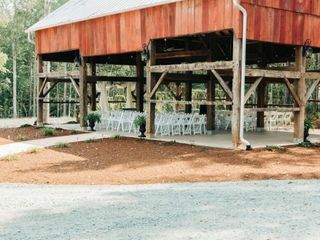 Across from the Lavendar Barn is the 1,300 square foot Pavilion Barn, an open-air restored hand hewn oak timber frame barn, another area for the ceremony and reception. The Pavilion Barn seats up to 125. 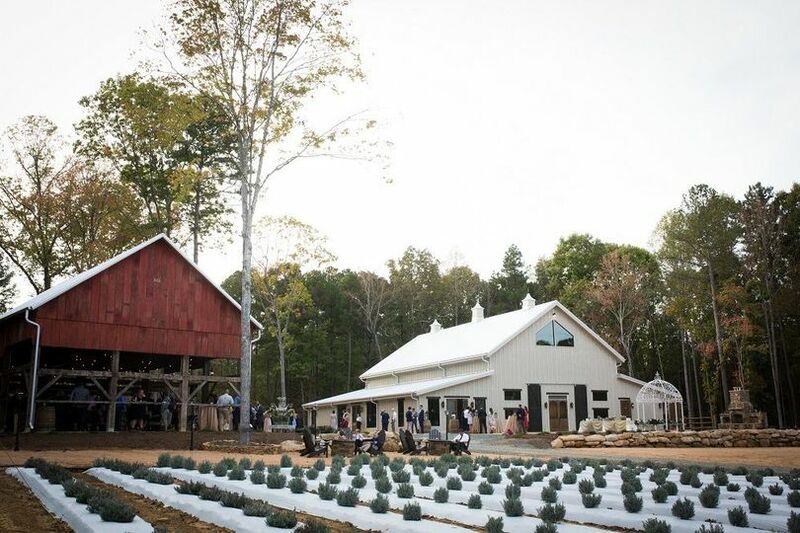 Aside from the barns and patio, the entire venue is open, spacious, and natural. There’s a pond and fields and, naturally, fields of lavendar. It’s a peaceful setting for a medium-size wedding. 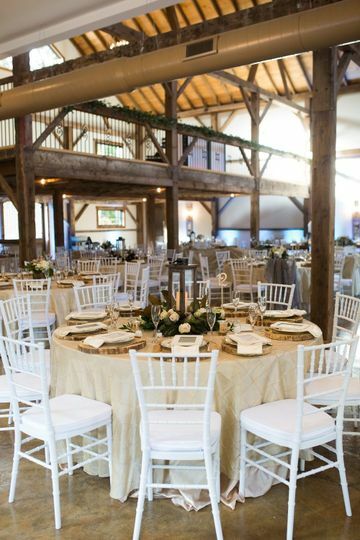 Included in the venue rental are round tables, white Chiavari chairs and cushions, white resin folding chairs, linens, centerpiece items, bridal suite, groom’s retreat, cake table and pedestals, farmhouse tables, sweetheart table, rustic wood lanterns, flameless ivory candles, easels, photo frames, apothecary glass jars, rustic wood bars, a “floating table,” wine barrels, and assorted outdoor furniture. There are three log cabins available for rent on the farm. 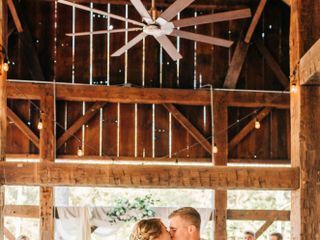 Reserving Lavender Oaks Farm for our wedding ceremony and reception was the best decision my husband and I made in our year long wedding planning process. The site is incredibly beautiful with its elegant rustic charm both inside and out. 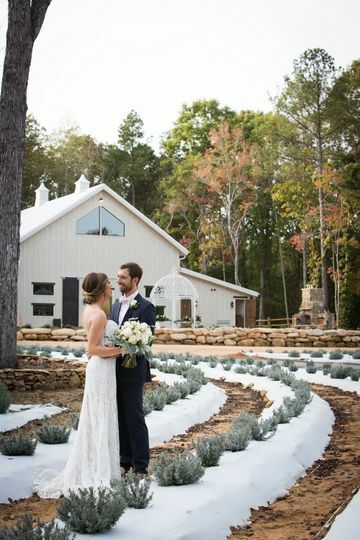 There are many lovely spots around the barn and surrounding lavender fields for incredible photographs and the unique space allowed us to host multiple events throughout our wedding wèekend. What makes this venue so very special are the owners, Karen and Robert. They are dedicated to making their farm, your farm, for your friends and family to enjoy and make lifelong memories. From the moment we began planning they were exceptionally warm, enthusiastic, and accommodating to all of our ideas for our dream wedding. The plan for our winter wedding was to be married on the stone patio in front of their iron gazebo overlooking the lavender fields, but eight inches of snow fell on Wednesday night. Panic could have ensued but Karen and Robert assured us all would be fine, and it was! Our weekend exceeded all of our dreams! We began our weekend with the rehearsal dinner and band for our one hundred guests to dance to. The roaring fire outside and s'mores bar created by Karen drew our guests outside to enjoy a rare Carolina snowscape. My husband stayed with his best man in one of the rustic cabins, overlooking a beautiful pond onsite, allowing him some personal guy time before our big day. Our wedding day arrived with the ground covered in snow and ice. Karen and Robert did not flinch as they moved our wedding ceremony inside. My nine bridesmaids and I arrived by ten Saturday morning to spend the day in the absolutely gorgeous bridal suite. We were pampered, we danced, we partied until it was time to walk down the isle. I was awed by the transition of the barn to a magical place that had only existed in my dreams. Karen and Robert took all of my personal ideas and dreams and made them a reality. Our wedding was truly a dream come true! Lavender Oaks Farm is a rustic barn, thoughtfully restored to its natural beauty with elegant and modern touches throughout. 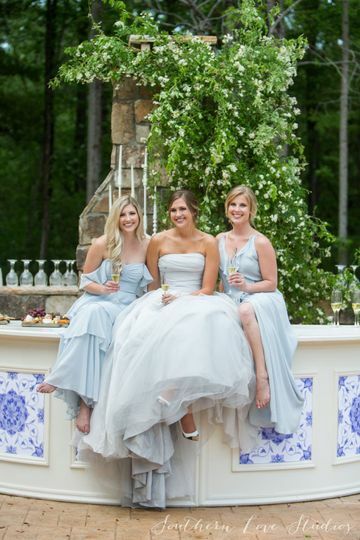 The farm is well equipped with a bridal suite, groomsmen cabin, and multiple ceremony locations. The property is beautiful and gives the opportunity for many different back drops for your photos. You are sure to find everything you need here at Lavender Oaks Farm. What sets this venue apart from the others are the amazing owners, Karen and Robert. They will make you feel like family from the moment you enter the barn; greeting you with warm smiles and their signature lavender lemonade. Karen is the most kind and caring person I have ever met. My expectations were surpassed again and again throughout the planning process. She is extremely detail oriented and truly an expert at her craft. Due to Hurricane Florence, my husband and I were forced to relocate our wedding a week out from our scheduled date. Luckily, Lavender Oaks Farm had a change in schedule and was able to accommodate our last-minute request. Karen and Robert helped us plan our dream wedding in six days. (Yes, that’s right- SIX DAYS!) There’s no way we could have pulled this off without Lavender Oaks Farm and their dedication to our special day. They are a pillar in the Chapel Hill community, evident by their ability to pull together various vendors we needed last minute. The venue was beautifully decorated with a combination of our personal decorations and the inventory of decorations they keep on site for brides. Karen has great taste and it was comforting to know I could count on her to bring our dream to life. It’s hard to give this review the justice Lavender Oaks Farm deserves. There is such a special place in our hearts for this amazing family and we have nothing but wonderful things to say. 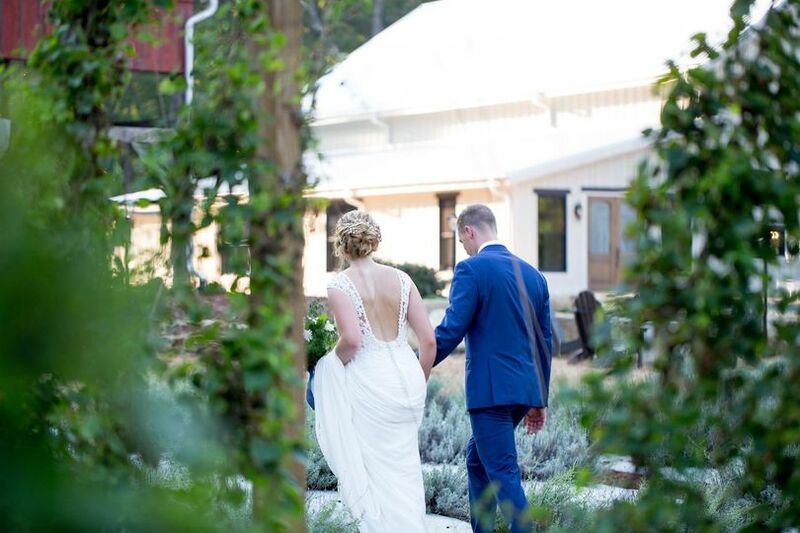 We look back at our wedding photos with such fond memories, all thanks to Lavender Oaks Farm. Without their dedication and willingness to go above and beyond, our wedding would not have happened on schedule. Please do yourself a favor and book Lavender Oaks Farm for your wedding- you will not be disappointed!